Robyn, you admit you are dog-obsessive! Your books clearly reveal this passion for the four-legged variety, including stories My Dog Socks, Midget Bones’ Diary, Dog Logic, D.O.G., and your latest, Bruno, the Boisterous Blue Dog from the Bush. Where did this interest come from? What is your experience and connection with dogs? Our family always had pets, so I grew up surrounded by four legged friends. Most were strays or rescue animals, as my Dad had a soft spot for the ‘underdog’! Of all our animals, my two favourites were dogs and goats. By the time I got married, I had amassed over 20 pet goats. Unfortunately my husband–to-be didn’t share my passion for these scallywag ruminants, so my beloved goats stayed with Dad. It wasn’t long before Snowy and Socks, both ex RSPCA puppies joined our household. Their entry into my life coincided with my renewed interest in writing. Following the advice from experts, I wrote about what I knew – which is why most of my short stories and books are about dogs! 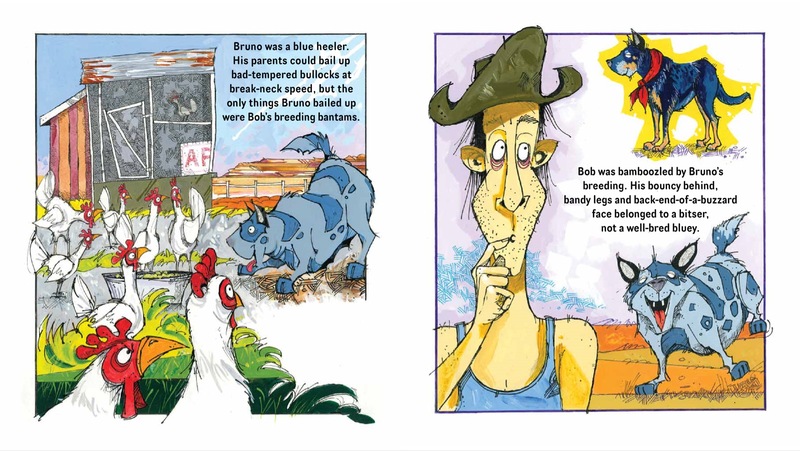 Bruno is a fun, alliterated and rollicking tale with great Aussie slang thrown in the mix. As an early childhood teacher, how did your background help you in identifying the language needs and cultural exposure for our younger generation? As a teacher I was frustrated by the lack of picture books which focused on Australian slang, so decided to create my own. The Americanisation of our language and culture dismays me, so I hope Bruno helps to promote this unique part of our Australian heritage. How have you found your audience have responded to Bruno so far? The feedback and reviews have been very positive. Children love the slang, the alliteration and the quirky illustrations. After sharing the book with many kids, I will admit that all those ‘b’ words are a little challenging to articulate. What is your ultimate goal for readers to gain out of reading Bruno? I hope readers will gain an appreciation of the colourful and unique Australian colloquial language. It is a big part of our history and it would be such a shame if it died out. Bruno must have been so much fun to write! What was your favourite part of the creative process? Finding suitable ‘b’ words for the book was great fun, as it gave me a legitimate excuse to pour through my dictionary and thesaurus. Researching and gathering the Australian slang was also very interesting. John Phillips’ illustrations are a sublime match for the energy, character and authenticity that shines from this book. What are your thoughts on how he has portrayed your settings, characters and little quirks? Were there any surprises along the way? I love John’s portrayal of the book characters, both human and animal. He also captures the Aussie outback landscape perfectly. The extra pictorial sub plots he added were a surprise, but a very pleasant one. 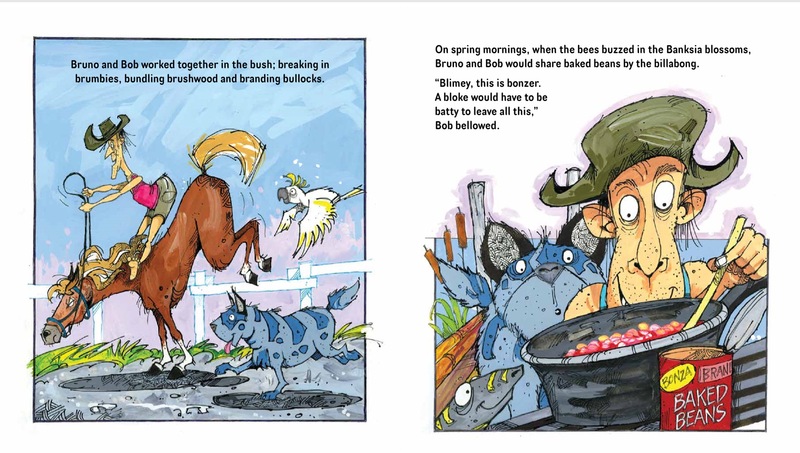 The friendly goanna and perplexed chooks that pop up on the pages add another dimension to the story. What has your publishing experience with Big Sky Publishing been like for you? How have they supported you throughout the process with Bruno and your other titles? Big Sky are great supporters of Australian authors and my experience has been extremely positive. Both Sharon and Di are very approachable, flexible and open to ideas. 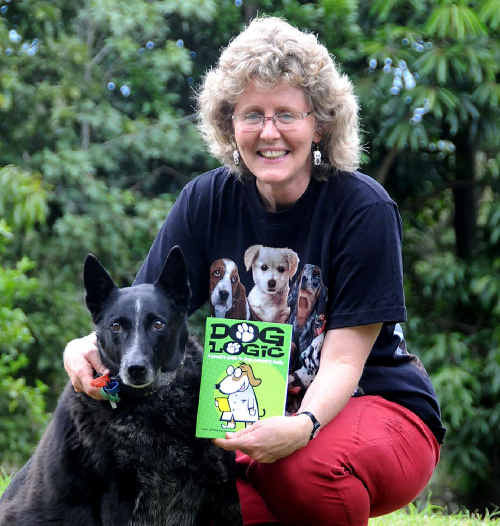 Since my first book (Dog Logic) was published by Big Sky in 2011, it has been wonderful to see how the business has grown and flourished over that time, especially amidst all the doom and gloom you hear about the publishing industry. Do you have any tips for aspiring writers on what makes a great picture book? Fun, topical stories matched seamlessly with excellent artwork. The interplay between illustrations and text is critical. Believe it or not, there’s even more to get stuck into! 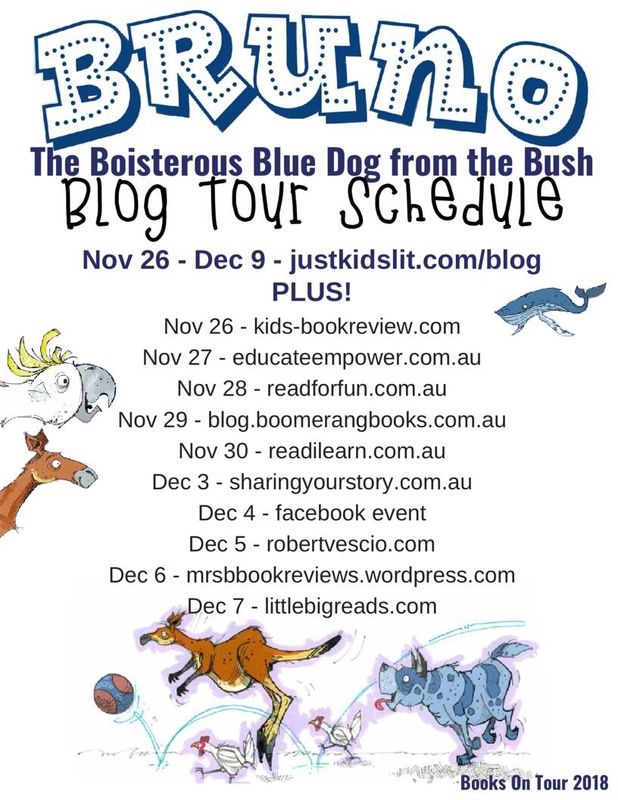 Head across to Melissa Gijsbers’ site, Read For Fun, for a beaut review of Bruno! It’s so easy to enter! Simply name a dog breed beginning with the letter ‘B’ for your chance to hit the bonanza! Subscribe at Books On Tour to stay in the loop.